Danny Peterson | 4/18/2018, 10:38 a.m. 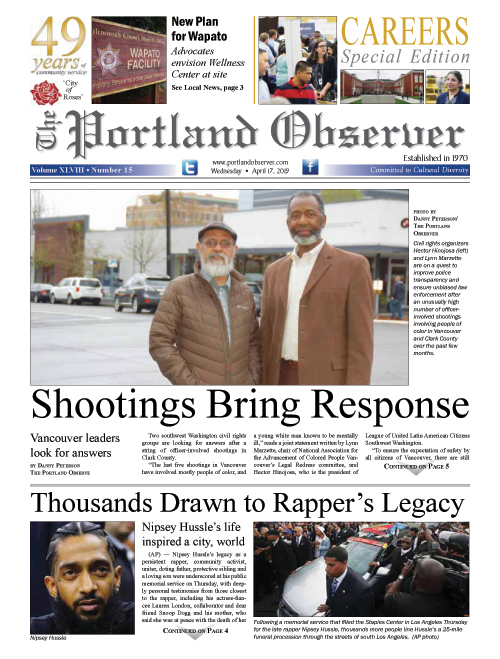 Seeing families overcome with medical costs due to chronic illness or injury and being forced to take extreme measures just to stay healthy was all too familiar to Oregon Music Hall of Fame alum and bluesman Norman Sylvester. That’s why he and other supporters for universal healthcare decided to do something about it by throwing an annual music festival to support the cause. The seventh annual Inner City Blues - Healing the Healthcare Blues Festival is this Saturday, April 21 at the North Portland Eagles Lodge, supporting Health Care for All Oregon, an organization advocating for healthcare coverage for everyone. The event will bring together a dozen renowned musicians of blues and other genres. Doors open at 5 p.m. and the concert will run until midnight. The King Louie Pain Quartet with La Rhonda Steele will be part of the lineup for the annual Inner City Blues – Healing the Healthcare Blues Festival, Saturday, April 21 at the North Portland Eagles Lodge. The musician and songwriter, who has lived in Portland for the last 40 years, cites a quote from civil rights leader Dr. Martin Luther Jr. to highlight healthcare’s role as a social justice issue. “Of all forms of inequality, injustice in healthcare is the most shocking and inhuman,” King said at a convention of the Medical Committee for Human Rights in Chicago on March 25, 1966. Sylvester, 72, moved by the need, has played benefit shows for his musician friends suffering from medical conditions over the years. Many of them first discovered through emergency services that they had serious illnesses like stage three cancers or diabetes, and then could not afford to pay for treatment. “Some of those benefits to raise money for healthcare turned into celebrations of life because it was too late. That kind of thing saddens me,” Sylvester said. Had those friends gotten to a doctor sooner, they might’ve nipped their ailments in the bud sooner, Sylvester explained. But lack of affordable care for even routine check-ups caused their diseases to progress without their knowing. The retired truck driver, who now plays music full time and teaches music and songwriting to kids at Irvington School, first arrived to Oregon in 1957 from Louisiana. It was his first introduction to attending an integrated school, among other firsts. Sylvester attended Jefferson High School and graduated with the class of 1963. “It was a whole new world for me,” he said. Sylvester had sung all his life growing up in church choirs in Louisiana and continued his involvement with music when he attended a church on North Williams and Wygant Street. A friend from church, Isaac Scott, who would later become known as the King of Seattle Blues, began giving Sylvester guitar lessons with an acoustic guitar his father bought him. “He told me if I learned four songs he would buy me an electric. So through Isaac Scott I learned four songs and my dad bought me that electric guitar and I've been playing ever since,” Sylvester said.